Bistek Tagalog is the Filipino version of the Beef Steak. It is comprised of thinly sliced beef cooked in soy sauce and lemon juice and garnished with caramelized onion rings. This simple yet great tasting recipe does not require much ingredients and the procedure is not complicated at all. Just have all the ingredients present, add a little love to it and Voila! You have your deliciously cooked Bistek. 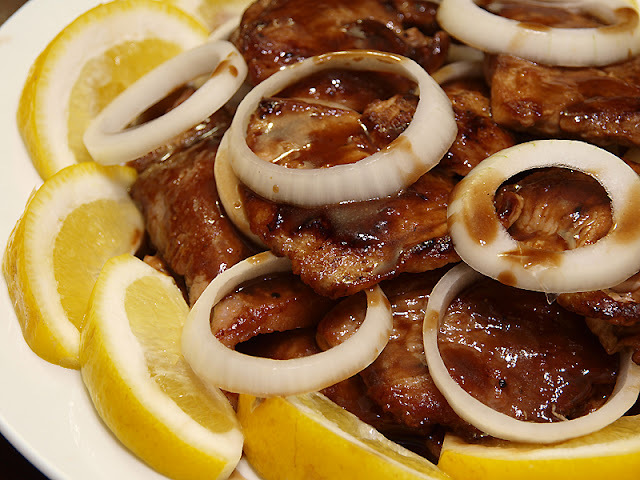 1 Marinate the beef slices in the kalamansi lime juice, soy sauce and pepper overnight in the refrigerator. 2 Heat the oil in a skillet and pan-fry the beef until medium-rare, about 30 seconds on each side. Transfer the beef slices to a plate. 3 In the remaining oil, stir-fry the onion until it is browned. Season the beef with a sprinkling of salt and drizzle a little of the pan juice over the steak. Garnish with the onion slices and serve.